With concerns over the recession and its impact on marketing, we decided to run a TopRank Reader Poll to discover reader (and their networks) preferences for digital marketing tactics in 2009. Companies world-wide are cutting costs as well as looking for creative, high impact and accountable marketing. Our amazing readers both on Online Marketing Blog and followers at @leeodden helped uncover the top tactics. 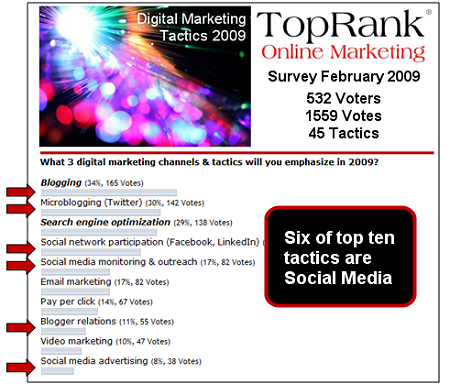 Over the past 11 days 532 readers have cast 1559 votes for their 3 top digital marketing tactics for 2009 with Blogging, Twitter and Search Engine Optimization topping the list. Equally interesting was that out of the top 10 tactics, 6 fall into the category of Social Media Marketing. See the full list below along with other statistics about where voters came from as well as info about the readership of Online Marketing Blog. See results for the full poll of 45 different digital marketing tactics here. All 45 tactics received at least one vote, even “no holds barred spam”. Email marketing rated higher than PPC which is surprising given the budgets spent on PPC vs email. Some tactics are much easier to implement than others, or less expensive, which may explain a few of the top choices, such as Twitter. Corporate web sites don’t rate in the top ten tactics. Does this mean the death of company web sites? At least in their current form it does. Some companies are succumbing to the social media perspective to extremes, like the Skittles site which has been simplified to a page of search results from Twitter on the Skittles name. Others are adding social features to their company sites to compliment existing messaging and functionality. I suggest somewhere in the middle is where many companies will end up by 3rd or 4th quarter this year. For promotion on Twitter, we generated a unique URL through Cli.gs, which offers some handy statistics as well as URL shortening. See the image on the right for the traffic to the Cli.gs URL, promoted exclusively on Twitter and the countries that traffic came from. 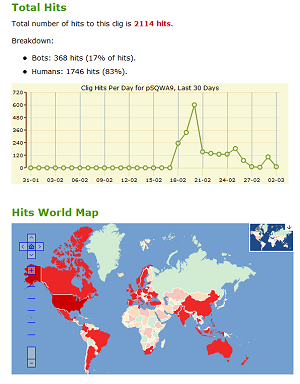 Overall, there were 36,144 visits to the Poll blog post over 11 days. Visitors came primarily from: United States, United Kingdom, Canada and Australia and spent an average of 2 minutes and 27 seconds on the poll. The large number of visitors compared to the number of respondents resulted in about a 1% response rate. For a one question poll, that’s low and undoubtedly, the large number of options (45 digital marketing tactics) may have been overwhelming. Feedback on the poll ranged from (“3 tactics is not enough” to “There are way too many options to choose from” to suggestions for additional tactics including providing APIs and livestreaming content. By now, most companies (we hope) have their 2009 online marketing plans in place. Does this ranked order of tactics mean you should change up your online marketing mix? The answer is that digital marketing tactics should match the needs of the situation, company resources, the target market and end consumer preferences. The proper tactical mix for an digital marketing program could be anything from the 45 tactics listed in the poll and still be successful as long as they support a valid strategy. Some companies are prepared for digital and social media marketing programs and many are not. To get “ready”, companies need to develop strategic plans and get up to speed on both best and worst practices. This TopRank Reader Poll on Digital Marketing Tactics indicates a strong interest in social media marketing. Whether those methods of reaching and communicating with customers reconciles with existing marketing plans or not, companies would do well to allocate resources to some level of ongoing education, testing and development of expertise in the social media space. Were the results surprising to you? Right on? We’d love to read your feedback and discussion. While future versions of this poll will actually be a multi-question survey, we’d love to get your feedback on making it a better tool for you. Great post although I think placing Twitter over SEO is a bit trend influenced. I can’t find a blog in the last two months that doesn’t trump Twitter. I’ve subscribed too. Stop by Referral Key and say hi. Seems to me the top 4 all belong together as inbound marketing. Separately they are not so powerful. It would be good to know how many use them in combination. Hey John, I’m not sure many of the tactics on the list are particularly powerful on their own. I agree with you that it is in combination that we see the most value. Example: building a network of interest via Twitter, Facebook and media sharing to drive traffic to a blog where visitors can subscribe via RSS and then “upgrade” to an email subscription of unique content where they can be provided with offers for products/services – advertorial. I love this. Thank you Lee! Interesting results Lee. Research proves that consumers not only expect companies to have a social media presence but they also feel a greater connection to brands that engage with consumer via these environments. I think the key driver continues to be the consumer. Is it compelling? is it relevant? do i want to share? I believe a marketer should be technologically agnostic and only honor the almighty consumer. Love your perspective Karen! Reaching and engaging the consumer is the key. Technology and communications channels are simply the means and as marketers, it’s our job to match tactics with the strategy that best meets consumer needs. Excellent summary Lee. Great to see the survey had so much support from the community. The top 3 fit my companies 2009 plans exactly. A combination of blogging, microblogging and SEO. Thanks Michael, much appreciated. It’s a great combination, especially when they work together. It’s great reinforcement to know that others share the same line of thinking. Websites should be seen as destination points. They are not interactive engagement platforms. That is why social media is called social media. It is about being social. People are looking to engage brands and in the process helping them improve to their liking. These connections should be cherished and leveraged for mutual benefit. Heap praise on great customer feedback and reward your customers too. Customer involvement in the growth of your brand is where you want to be. Treat your customers with respect and add as much value to the relationship as you can by providing WOW moments when they least expect it. Great post…..but….as I have been delving through blog after blog after blog trying to discover how we can help small businesses to benefit from the power of social media marketing – the above comments would seem to hit the nail on the head. Some seem to say that it is worth a small business owner’s time to use social media to get the word out because it’s free, it gets quick results, it’s flexible, it gets easier with time, that it will lead to other valuable sources of traffic, that it builds links with social media and is safer than buying links, that social media users are predictable, that it doesn’t require as much time as we might think, that branding through social media is possible, that links can help your search engine rankings to rise quickly, and it allows you to leverage your existing traffic. And you may just target some visitors. In summary, the word declared is that the future of the internet is social. So be there. So whether it is Facebook, MySpace, Flickr, Twitter, Blogs, consumer review sites, forums, discussion boards, online communities, social book marking sites, social news sites, social music sites and more. Whoo! I just get worn out writing about all these. We are being told to be there. But the BIG question is this: Where is a small business owner going to get the time to do all of the above? Or do they need to hire a force of writers to get the word out? Or do they need to simply choose a few places on the Internet where they can begin to build relationships on a deeper level and then be positioned as experts in their own field? These are the many questions being asked by business owners today! But the biggest question is: Are we as small business owners in the 21st century going to wake up after it’s all over and agree with Avinash Kaushik, currently employed as Google’s analytics evangelist., surprised that ‘it’s not better’? Interesting post Lee. Wondering if you see a variation in the rankings from in specific countries for instance India where social network participation currently seems to outstrip everything else. Thanks. Very good content. Thank for great information. That was certainly an interesting post I beleive that Twiiter is a great way to spread any buzz extremely fast. Check Out this funny viral video about how the new depression will be great!! Excellent post! The first 5 are right in line with the trends that I’m beginning to see thus far in 2009 – almost to a “T” in order. I’m noticing companies focusing their efforts on blogging as a foundational element for their over-arching digital marketing strategy. That way companies are able to keep their website relevant and fresh while utilizing the additional tactics mentioned to promote and drive traffic to the site. Good post, the 10 top tactics are on the mark! Good tips.The Skittles example is interesting,I bet it was done to raise discussion about the product itself to sell more. When it comes to social media marketing, you just need to find the right combination that you feel comfortable with.For me it is submitting useful links (other peoples links as well) to social sites, blogging and commenting on other blogs. Good findings. Shows that customers are actively ready to engage brands through social media. As its used as an accelerator, rather than an answer, and genuinely fits in with your target market’s values, there is reason not to commit building an online social presence. Good post, I’m glad to see that blogging is still at the top of the list. Great thoughts and helpful in my line of work. Interesting comments. There are things to be weary of as some of the biggest blunders in history came about because of customer involvement in products. The Edsel had tons of customer input and is among many failed products. Can you share some demographics about the people who took the poll? I’m wondering if they are agencies, small businesses, large, etc.? I met with a client today (medium size company) to review their SEO plan. When the conversation turned to blogging, social media and Twitter there was a lot of resistance and skepticism. My very unscientific research from other conversations very similar to this one tells me the early adopters are the ones blogging and Tweeting, while the majority are trying to do SEO and PPC and email marketing well enough to get by. Hey Bernie, Blogging, Tweeting and many social media tools facilitate SEO by enabling linkable content to be distributed to audiences that can publish. ie, Social Media works quite well with SEO efforts. As for demographics of our poll participants, we’ve not taken surveys of our readers’ demographic info. But from 5 years of blogging I can say it’s a mix of big/small companies and a variety of agencies in PR, search and interactive marketing. I feel like it warrants a follow up that determines the resources that marketers have allocated to implement social media tactics. To be effective, social media tactics can be resource intensive. Without adequate resources, how many marketers are setting themselves up for failure? Hey Troy, I think resources are definitely an issue based on inadequate planning. That’s why we recommend a strategic approach to social media. Many, many companies come at it as a tactic using a particular service without having done their homework, forecasting of resources or proper planning in case it fails or even if it succeeds. I totally agree about the resource intensive nature and the fact that the top 4 can essentially be classified as inbound, I wonder what’s covered by email marketing? Has blogging done away with newsletters? To improve your response rate to the poll I would suggest limiting the pre-determined choices to no more than 10 with an option to write in any alternative not listed. Many seeing a 45 item list pass it up as too much work to sift through the choices. I like the consistenly high quality of your posts. Interesting information. I’m deploying just about everything on your list. I use all social networks to give traffic toward my blog or capture page. Blogging / video is a great way to build rapport. Social media is a means to an end. It helps develop online brand, awareness and information sharing. You still need a good website that is informative, easy to use and accessible.